Today we are making pom poms. LOL. Lots and lots of pom poms. We are adding the pom poms to bookmarks for little handmade presents. I found this little tool at the fabric store that makes making them really easy. Love little tools don't you? The tool is a pom pom maker from clover. Then close the arms and cut down the groves on the arms. Here is what it looks like with the yarn cut. Tie tightly and then open up the arms. After a haircut it looks much better. 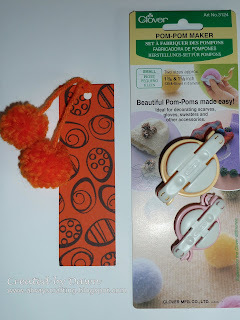 Here is one of our finished bookmarks and the clover pom pom tool. [the bookmark is just cardstock cut into a rectangle and stamped. Then lastly, a hole is punched at the top and the pom poms are added. What can you make with pom poms? So cute! And they look so easy to make, that I think I could even make them myself. What does the little tool run for? And can you get it somewhere like Michaels or JoAnns? Love the idea of adding them to the bookmarks. What a adorable idea! Thanks for sharing. Christine, it is available at Joann's for around $5 or $6 if I remember correctly. That is a great tool. Love your bookmark! I definitely need to find this gadget!! Thank you so much for doing this Dawn. What a neat little tool and the pom poms look so cool. I guess next time I'm at JoAnns. LOL! A new toy. I love it. Thank you again.